What sous-vide hanger steak looks like at various temperatures. Salmon cooked at various temperatures. Interesting: fish often go through two zones of goodness: a low temp zone usually described as having a fudge-y texture, and a higher temp zone that makes a more classical texture. Fish cooked between these zones squeaks when you chew it. The exact temperature of the two zones depends on the fish itself, the season in which it was caught, the fat content, etc. Should I sear before or after? How much does the internal temperature of my meat rise when I sear? Enjoy. How long do I need to cook to kill bacteria? Here you go. 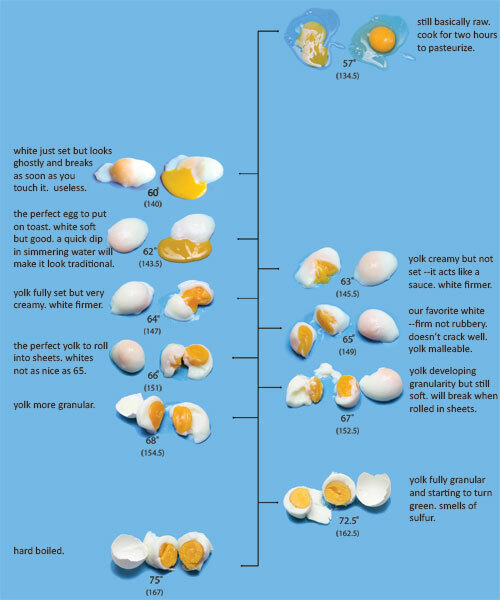 What happens to eggs at various temperatures? All eggs were cooked in a water bath for 75 minutes (an hour is enough) at the temperature indicated. The times and temperatures we use to cook. There is no right and wrong --just what you like. Any thoughts on posting a quick guide to infusing spirits via sous-vide? You mean in the primer or as a separate post? Excellent reference post. Thanks for putting in the work. Great figures! Inquiring minds want to know what software you’re using. Any hints? We are Adobe all the way. Photoshop and Illustrator. I don’t have Indesign. OH MY GOD. This is wonderful. Like a SV bible. Can you please link to the original sized images instead of the tiny ones? I’ll work on it. Thanks for the kind words. Can you do us some higher resolution versions of these charts? They’d be great to laminate and keep in the kitchen. Wonderful. Nice graphics. Amazing to think this hasn’t been done since now. I’ve printed it out and put it on my Fridge. This is brilliant. Will you be putting in a vegetable section? There will definitely be something on vegetables. Is there anything in particular you’d like to see? Potatoes — waxy versus mealy. Whether they infuse better with oil or water-based flavours. Higher-cellulose vegetables like carrots, do they need a higher temperature and time? Green vegetables, can they be cooked sous-vide without turning grey (brussels sprouts would be interesting)? Delicate vegetables (really fruits) like peas — is there a low-temperature way of cooking them and keeping them sweet? That’s before we get to fungi (mushrooms) and fruits. Thanks for the reply. This is just a taste? Awesome!! Wow, this looks great. Since you’re making something nice out of it, I wanted to remind you that in the last picture, it should be spelled Celsius. Crap! Thanks Dan. Good catch. Noted and Fixed. Do you have cooking times for pork chops, or do they not come out nice by SV? I don’t cook them often but i’d think they’d be fine. I’d say 60C for about an hour or so. for the sake of completeness, how about seafood? Shrimp, lobster, etc…. Also, whatever happened to the Ike Jime lobster technique?!?! We will try to include a crustacean part. Still have lobster under wraps unfortunately. While I agree with most your times and temperatures, the times for duck and squab are not sufficient for pasteurization. In [J Food Sci 68(4), 2003, pp. 1443--1447], a one decimal reduction in Salmonella and Listeria in duck is D[57.5C] = 14.31 min and D[57.5C] = 23.64 min, respectively. 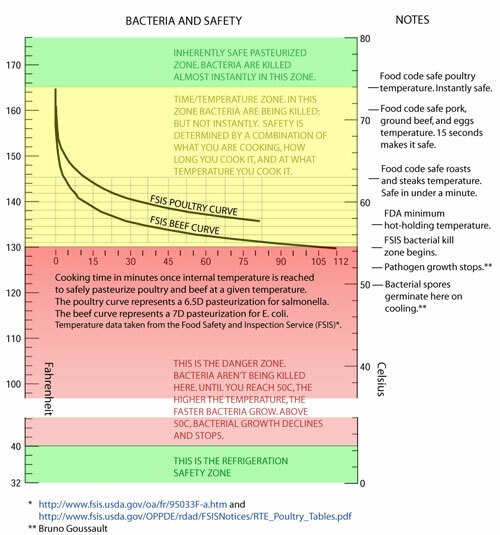 So a 6.5D reduction in Salmonella (which is what the FSIS wants) takes 113 minutes at 57C (in the slowest heating part). 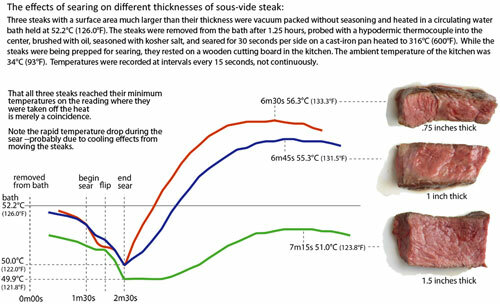 Based on my calculations (see my guide for details), a 25mm thick duck breast in a 57C water bath needs to be cooked 2.5 hours and a 35 mm thick breast needs 3 hours to reduce Salmonella 6.5D. Good to hear from you. I agree with your number. The dirty little secret is that we often don’t cook to pasteurize. I don’t think a good pasteurized tenderloin can be made, for instance. I don’t worry too much about the duck because our cooking isn’t making it any less safe, it isn’t being stored too long, and we are going to post sear it anyhow. True, beef and duck are not traditionally pasteurized. The general view being that the interior of intact muscle is essentially sterile. (So searing the surface is enough to make it safe.) The problem, is that some of the beef that is now being sold looks intact but is not. Many processors are now mechanically tenderizing (Jaccarding) their beef with needles or small blades that can push surface pathogens into the interior of the meat. Since the processors are NOT currently required to label the meat as being mechanically tenderized, we can no longer assume that searing the outside is sufficient to make it safe. Until the FDA begins requiring that mechanically tenderized meat is labeled as such, I strongly recommend pasteurizing everything (and not cooking things, like tenderloin, that are ruined by pasteurization). Congratulation for this fantastic article! When are you going to discuss the sous-vide burger process? Apologies if you already have. Soon. We don’t use sous vide on them, just low-temp. This is great guys! In which form would you make it available to people? I am going to make downloadable versions. THe primer will probably be in installments on the blog. Holy cow, this looks absurdly fantastic! I find myself using SV for making confit of pork (shoulder or belly) and duck more than anything these days — maybe a little info on that preparation would be good (I’ve come to the conclusion that 82deg is better than 85 for pork shoulder, though I’m not totally confident about that). Also, info on cooking offal like gizzards and hearts (also very good confit’d) would be swell. I’ve never done 82 vs 85. What is the difference and how long do you cook? For pork shoulder, I usually rub it w/ salt, garlic, etc. and cure it overnight, then rinse and cook for 6-8 hrs. At 85, the result seemed a bit more dry than when cooked at 82. Either way it’s delicious, though. It’s good cut into chunks and seared/broiled, but I usually shred it and then crisp it up in a little of the rendered lard (and then throw in some of the jelly that gets left over in the bag at the end), like carnitas. Crisped up shreds of salty pork are great on top of a thick squash soup, etc. I forget what temp I’ve done gizzards. I think I followed the technique from Under Pressure, though. They are fantastic. I have not used the sous-vide supreme. From what I here it is uncirculated, meaning it would probably work best with longer cooking foods. Thanks for the link, Matt! I have several crock pots and rice cooker as well as a Foodsaver vacuum. I’ve seen an acurate temperature controller for about $150 you can use on a crockpot as well. The aquariuim bubbler is a good idea. What do you mean that you don’t use sous vide, just low temp on burgers? I made some SV sliders the other day (like the ones we had in your Tech for the Home Cook Class a couple of weeks ago). I did them at 135 for 4 hours or so. Is this different from the ones we had in class? The ones in the class were done in ziploc bags. The Board of Health doesn’t consider ziplocs sous-vide (thank god), because we haven’t sucked a vacuum on the bag, just gotten rid of the excess air by immersing in water. If you actually sucked a vacuum on the burgers I’d think you’s compress them a bit, but I could be wrong. Does anyone know how long to sous-vide a potato at 65 Celsius? I assume you are trying to set the starch granules a la Steingarten (and Blumenthal, Dufresne, et al). I think you need to do that about an hour. 65 won’t actually cook the potato. just wanted to applaude the effort – great stuff. What temp do you like for pork shoulder to give a pulled pork -type texture? You say 60C/72hr is “mushy” — does that mean “like pulled pork” or does that mean something else unpleasant? Sorry Scott, I don’t think I answered this yet. I would say unpleasant. Certain muscles in the shoulder don’t have a lot of connective tissue. Those naturally tender cuts tend to get fiber-y mushy when cooked too long. What is weird is that they have a lot of juice on the first bite, but turn pasty as you chew. 2oz patty seasoned, shaved pork belly (frozen, microplane), repeat 2ice, then RM to glue em together. sealed to help form into one patty. Where is the cart going to be? I just cooked a burger SV at the temp and time you indicated 57C for 45 mins. I have to say it was fantastic. I’ll post the pictures on my blog tonight. Done the burger, was great. I posted the pictures on my blog. Thanks Jeremiah for inspiring me into trying it. I buy all my beef from a farmer I’ve known for years. I know that my beef has not been mechanically tenderized and is intact. So I know that the interior is essentially sterile and searing the surface will make it safe. This allows me to choose the doneness (i.e., cooking temperature) and texture (i.e., cooking time) of my beef without having to worry about pasteurizing. If I didn’t know whether my meat was mechanically tenderized, I would be obliged to pasteurize it. As Dave pointed out, very tender meat is ruined by pasteurization. So if I purchase my meat at the local supermarket, I would only buy cuts that benefit from longer cooking times. These charts are great! Looking forward to the finished project! The Bacteria chart could use a label (or note somewhere) for the horizontal axis – it took me a minute to figure out that it’s minutes. Between this preview of your terrific charting, Doug Baldwin’s paper, Keller/Ruhlman’s book and several other sites and books, sous vide cooking is beginning to get a bit clearer. What I appreciate is that several places have now clarified times and temps for various meat and vegetable products to reinforce my thoughts and give me a target to follow. If your paper will be as easy to reference as say The Flavor Bible, many of us will be in your debt. Hi Dave, do you have these primers in a PDF format? these pics are a little difficult to see and would be awesome to print them out as they are. Awesome work, I dont know what we would do with out yall. The pdfs are done. We’ll post them soon. Amazing Class! Thank you! I look forward to tomorrow! Nice airstream. How’s it going? Thanks to John Bailey for mentioning our book “The Flavor Bible,” which triggered a Google News Alert that brought us to this page. Very useful stuff for sous-vide practitioners — we’ll link here from our Twitter account at http://www.twitter.com/karenandandrew next. Would also love to see a bit about equipment. i.e. recommended brands of circulators and how to do it on the cheap, aside from sticking a thermometer in a pot of water and manually regulating the heat. Will try Vice. That might be a separate post. Do you know anything about the new sous vide countertop models that are coming out for home use .. this is one of them …. Can you recommend any ? or would you still suggest a home user go with polyscience? Essentially, the sous-vide magic (It should be called the low-temp magic becasue it has nothing to do with vacuums) is just a temperature controller with a thermocouple attached. It isn’t actually 1800 watts, it has a relay that can handle 1800 watts (from your rice cooker, etc). This unit does not have a circulating pump, which I would recommend. You could jury-rig your own pump. I have built rigs like this in the past. 159 bucks is a good price for a thermocouple, relay, pid contoller bundle. You’d have a tough time making it cheaper yourself. While you could definitly create a workable system this way, nothing beats the ease-of use of a circulator. Remember that because you are providing the heater, you are limited in this setup to things like soup warmers, crock pots, rice cookers, etc. 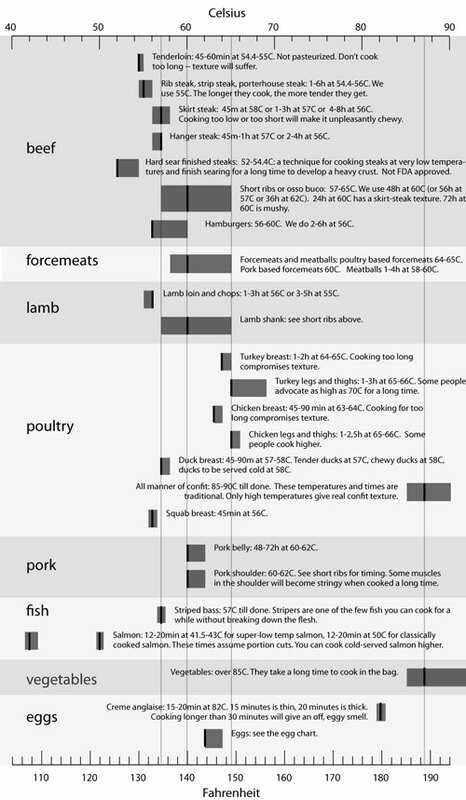 Since SV cooking times can vary exponentially based upon thickness of the protein, it would be great to include something about that in the meat department! It’s been a long time! This is great! We’ve been trying SV cooking these days in Korea. But can’t get much information here..
1. do you not recomend cooking meats in sauce in circulator? 2. are there any herbs or seasonings that I shouldn’t use for SV cooking? Can’t wait to go back to school and take your classes. Please say hello to everyone! Jeff tells me everything is going well. 1. You can cook meats in sauce in the circulator, but the sauce needs to be over-reduced first. 2. Anything can be used but the more aromatic herbs should be scaled back and shouldn’t be allowed to physically touch the meat. Nice, Thanks for your work. Great job on the charts and thanks for the very thorough research! Thank you so much guys. This is a very informative and useful post!! Awesome. Keep up the great work. Always love this site. Charles- i just ordered and received the $150 temperature controller. works well and very sturdy, but all should be warned that some crock pots are finicky and don’t like restricting electricity. i think a rice cooker is next along with a scale to the tenth of a gram- working on a ‘toad in the hole’ with a sous vide egg on one side of the toast and a molecular gastronomy bacon ravioli on the other side.